If you haven’t heard of Ninja, chances are you’re not a gamer. Ninja has become the world’s most popular Twitch streamer and has amassed a massive following streaming Fortnite. So popular Ninja consistently plays with major celebrities like Drake, Ellen and more. 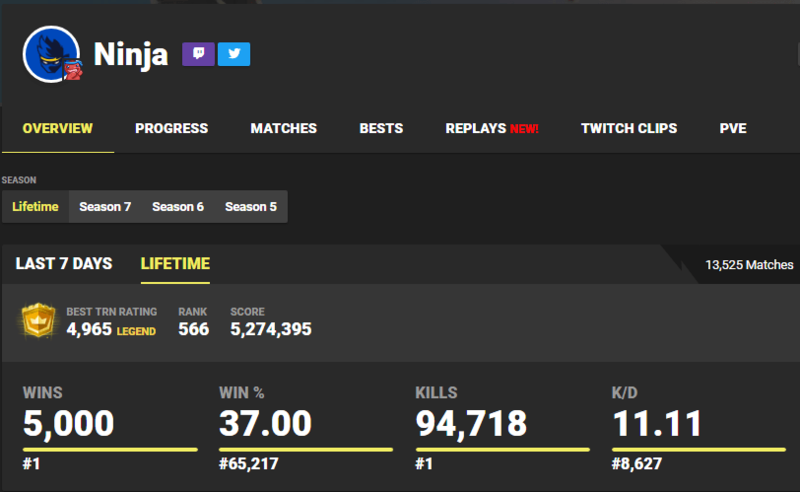 On December 27, 2018 Ninja also became the first PC Fortnite player to get 5,000 total wins. Alongside his win record, Ninja also has the most total kills on Fortnite spanning all platforms. He currently is sitting just short of 100,000 kills at 94,718. In total Ninja has won 5,000 of his 13,525 matches played, in other words Ninja has a 37% win rate. To go with that 37% win rate Ninja was able to collect almost 95,000 kills with a 11.11 kill to death ratio. To those that don’t play Fortnite that may not mean much, but those are truly video game super star numbers. Those numbers are incredible given the time Ninja puts into the entertainment portion of the stream. Of the 5,000 wins 1,823 have come in solo games, 1,721 have come in duo games, and 1,456 have come in squad games. Of the almost 95,000 kills 38,745 have come in solo games, 29,113 have come in duo games, and 26,860 have came in squad games. Given the even balance it’s safe to say that Ninja is capable of winning at a high rate in any game type on Fortnite. Upon reaching the milestone Ninja thanked Epic Games (the creators of Fortnite) for making such a great game.